A few months ago, the Puerto Rican Treatment Plant Operators Board of Examiners announced an exam for current and would-be drinking water treatment plant operators. As a result of this announcement, several communities requested assistance in preparing. 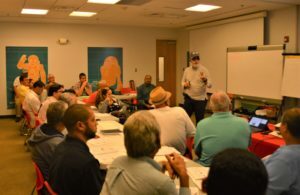 RCAP Solutions’ team in Puerto Rico quickly arranged a free training session, opened registration, and just as quickly filled all of the available spaces. The training session was conducted in November 2018 and covered areas of math, biology, physics, and chemistry – as well as other topics like safety, equipment maintenance, regulation, and public health. The goal was to assist prospective operators who already had basic knowledge of how to treat community systems by giving them a “refresher course” regarding topics that would be on the exam. This entry was posted in Blog, drinking water, RCAP, Uncategorized and tagged drinking water, Puerto Rico, RCAP Solutions, wastewater. Bookmark the permalink. ← It’s a Great Time to Clean Up Your Credit!